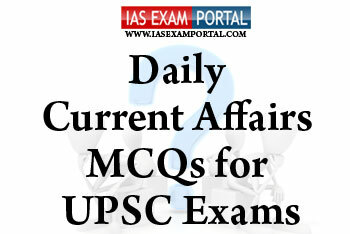 Current Affairs MCQ for UPSC Exams - 11 October 2018 | IAS EXAM PORTAL - India's Largest Community for UPSC Exam Aspirants. Q1Which of the following statements regarding PM vaya vandana yojana are true ? 1) The scheme aims to protect seniors from the vagaries of falling interest rates and offers assured pension based on a guaranteed rate of return of 8% per annum for ten years. 2) Income from annuities of pension plans such as Pradhan Mantri Vaya Vandan Yojana are not taxable. 3) If a policyholder is not satisfied with the “Terms and Conditions” of the policy, he/she may return the policy to the Corporation within 15 days. Q2Consider the following statement regarding the chemical Bisphenol A recentky seen in news. 1) It is a colorless solid that is soluble in both organic solvents and water . 2) While BPA that seeps into food and drink is considered safe in low doses, prolonged exposure is suspected of affecting the health of children and contributing to high blood pressure. 3) China was the first country to ban Bisphenol A declaring it to be a dangerous chemical. Q3Which of the following is the nearest port access to Iran from India for import ofcrude oil ? Q4Which of the following statements regarding Foreigner registration procedure in India are true ? 1) Foreigner registration is a mandatory requirement by the Government of India under which all foreign nationals visiting India on a long term visa are required to register themselves with a Registration Officer within 10 days of arriving in India. 2) Foreign children below the age of 16 are exempt from registration requirements. 3) Under the new e-FRRO scheme, a foreign citizen is no longer required to appear in-person at an FRRO, unless specifically required to do so. Q5Chapchar Kut, Mim Kut and the Pawl kut,all three festivals are solely dedicated to agricultural activities. The festivals are celebrated to mark the arrival of spring with extravagant feasts and intricate traditional dances.